Welcome to our ETS meeting in Brisbane at the WADEM congress! 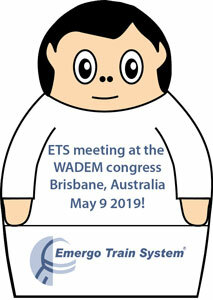 Welcome to our Emergo Train System meeting in Brisbane at the WADEM congress! The meeting is open for ETS Senior instructors or anyone who is interested in simulation and training with Emergo Train System (ETS). The ETS Competence center will host a meeting with presentations and discussions. It will be two similar sessions in order to allow for congress participants to attend other WADEM sessions. The meeting will be held at the Brisbane convention and exhibition centre on Thursday May 9 after lunch (13.00-17.30). No registration needed.